Constantine the Great (r. 324-337) reunified the Roman Empire as its sole ruler in 324 and promptly began the expansion of the little harbor city of Byzantium on the Bosporus, renaming it Constantinople. Replacing Rome as the imperial capital, the city reflected the emperor's new Christian faith in the central cathedral complex, while Hellenistic and Eastern schemes were used in the city's public areas. The Byzantine Empire's vast, all-Mediterranean territory was greatly reduced after Justinian (527-565). It was beset by many reverses and crises throughout the flowering of the Macedonian dynasty (867-1056) and suffered its most brutal shock during the Sack of Constantinople by the Crusaders in 1204. Throughout the period Constantinople exerted a cultural, a spiritual, and at times, a military authority on its western and eastern neighbors, an influence that was reestablished during the Palaiologan dynasty (1261-1453). Byzantine art and architecture survived the empire's fall in 1453 to the Ottoman Turks by continuing in the Eastern Orthodox heritage. A Spanish rabbi and traveler, Benjamin of Tudela (1127-1173), reported on a visit to Constantinople that, "All the people look like princes. The Second Rome is a glittering city of miracles. Everybody is dressed in silk, purple and gold" (Geijer, p. 129). Such awe was a frequent reaction in Western visitors when encountering the splendor of the capital; they were also hopeful to be on the receiving end for imperial favors. These might take the form of superb Byzantine textiles, exceptional gifts of prestige and diplomacy for select secular or ecclesiastical rulers. Many of these silken achievements of superior loom technology and dyeing excellence survive in the early 2000s, often reduced to tiny fragments in church treasuries and museums. Patterned and figured, monochrome or multihued, these silks were made into vestments for powerful bishops and abbots, served as wrappers or purses for relics, and were draped, as large pallia, over the remains of saints in shrines and tombs. Rare imperial inscribed silks are known to have been stored in the west for decades or centuries before being used as funerary textiles. Silks from the imperial workshops and city guilds also came west in the trousseaus of Byzantine princesses. 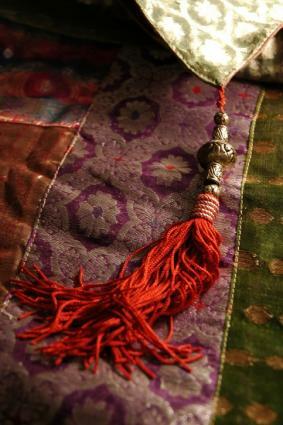 Yet others were silks of lesser quality, some made in the Islamic East, and purchased by Western visitors to Constantinople. Europeans were probably unaware that an important reason for the strict ceremony of the imperial court in Constantinople was a long-standing game of one-upmanship vis-à-vis the equally elaborate etiquette in the courts of Middle East, and, from the late seventh century, Islamic rulers. Intricate court ceremony had a long history in ideas of divine kingship. Prior to Islam's introduction, the Byzantines had established relationships of reciprocity in peacetime as well as war with the Sassanian dynasty (224-651), by sharing designs, motifs, and figures. The first Islamic rulers of the Umayyad Caliphate (661-750) attempted to match the opulence of Byzantium in the architecture and decoration of their desert palaces. The Abbasid Caliphs (763-1258), settling in Baghdad, provided further rivalry to Constantinople in conspicuous consumption; late eighth-century texts describe how Syria's merchant fleet supplied luxury items to the Byzantine court. These interdependencies explain the numerous shared features in the art and architecture of the Mediterranean cultures, as well as the staying power of certain recurring motifs. After 1453, Byzantine style survived and continued, especially in embroidered panels used in the sacred and secular life of Greece, Armenia, Bulgaria, and in the monasteries of Kievan Rus. The 912 Book of Ceremonies of Constantine VII (d. 959) sets out the elaborate, ranked dress requirements for courtiers and administrators of the empire. To meet these prodigious needs, textile production was prioritized and put under imperial control. The first generation of skilled weavers had been brought during the sixth century from the Mediterranean or Persia, where the draw-loom pattern device had developed since the third century. This technology allowed figured motifs to be mechanically replicated. The weavers' privileged position was hereditary to begin with, but later the conditions worsened as the state attempted to maintain control of the market forces. Texts such as the Book of the Prefect (Eparchikon Biblion), in which the regulations for the city's five private guilds were codified, details the organization of textile manufacture in Constantinople. There were merchants (metaxoprates, raw-silk dealers; bestioprates, silk-cloth vendors; and prandioprates, Syrian silk sellers) and manufacturers (katartarii, silk-thread producers; and serikarii, weavers). Specialized trades of dyers of purple, weavers, and tailors worked in the imperial workshops, but information about the actual operations or types of equipment can only be inferred from the few surviving examples that can be securely identified. One striking feature of the finest silk pallia with their large-scale designs and multiple colors is the loom width. Some were more than 6 feet (2 meters) wide, requiring extraordinary technical capability in loom construction and accomplished levels of collaboration during the weaving. Silks from production centers outside the Empire do not match these dimensions; the widest from Zandaneh, near Bukhara, measured 47 inches (120 centimeters). The Abbasid silk fabrics, imported in significant quantities to Constantinople by Syrian traders, indicate a range in weaving quality-the Byzantine wealthy may well have been dressed in imported Syrian silks, while true panni imperialis were reserved for the court. A surviving group of red-ground textiles, the so-called Samson silks, shows a standing man wrestling a lion framed by undulating borders; it is proof of the merchants' ability to provide an efficient supply chain for various markets. Details in the drawing of the figure and the execution vary from one example to the next, giving a range of quality for a popular theme from fine and perfectly woven to coarse and replete with weaving errors. Rabbi Benjamin mentioned in his eleventh-century report that 2,500 Jews worked as dyers in Byzantine Pera, and 2,000 more in Thebes on Peleponnesos, evidence of the degree and scope of specialization in the trades. The rare Tyrian, or Murex, purple dye was of ideological importance especially to the Macedonian dynasty that designated its heirs as Porphyrogennetos (i.e., born in the palace's purple marble room). Analyses of the dye content in the surviving corpus of Byzantine textiles reveal that a small minority contains the fabled and prohibitively expensive true shellfish purple; most are combinations of indigo-blue dye, cross-dyed with madder or kermes red. Murex purple has been confirmed in the silk yarns weaving the clothing of the Virgin Mary in the famous Sancta Sanctorum silks, and in certain of the imperial eagle silks. The imperial production centers prioritized pattern-woven silks in mechanically repeated designs, produced with relative speed and ease on the draw-loom. Other types of textiles, such as plain woolens and linens, certainly coexisted with the prodigious output of the Constantinopolitan looms, but their survival rate is scant by comparison. Structurally, the great majority of the surviving patterned silks use compound twill (samit, samitum), in one or more colors. Plain weave (tabby) is represented; some display supplemental or compound patterning. A novel compound weave, lampas, appears in its fully developed version in which different weave structures are combined (such as plain weave and twill or satin), first in Baghdad, and presumably soon thereafter reaching Islamic Spain and Constantinople circa 1100. Early Byzantine textiles rendered in tapestry technique with Greek inscriptions have survived in Egypt's dry sands in considerable numbers. Usually termed "Coptic," although some have been shown to be Syrian, they are made of linen and colored wool thread for making clothing components, clavi, and for decorative curtains and wall hangings. A later, rare and large eleventh-century example in silk, circa 2 meters square, was found in the tomb of Bishop Gunther (d. 1065); it depicts a mounted, triumphant emperor. In classical texts, Greek women's needlework skills are celebrated, and establish traditions that lived on in Byzantine women's quarters, gynacea. Groups of fourth- to seventh-century woolen embroidered panels for clothing and interior decoration with late antique themes and Greek inscriptions have been found in excavations in Egypt. The figures in the border of Empress Theodora's mantle in the famous Ravenna mosaic, for example, are thought to be embroideries. Needlework in the Palaiologan style survives in splendid works created for Russian monasteries from the fifteenth century. The meta-language of power and divine privilege in ancient Middle Eastern royal motifs and compositional schemes was assimilated in the cultures around the Mediterranean. Weavers in Tang Dynasty China (618-906) also adopted it for silk designs produced for trade. The animal motifs include lions, elephants, eagles, and fantasy hybrids such as the senmurv and griffin, often incorporating a tree-of-life, and nearly always framed by the ubiquitous decorated roundel, a long-lived style that only waned by the thirteenth century. Small floral and geometric motifs, also based on Sassanian models, include heart- and spade-shaped foliate motifs in horizontal or offset registers. During the periods of Iconoclasm (726-787, 814-843) when no figurative depictions of Christian divinities and persons were allowed, Constantinopolitan workshops favored motifs that evoked the heritage of the late antique, depicting charioteers and hunt scenes. There are still only a few monographs on Byzantine textiles. Most works cited below treat the topic in considerable detail, however, and in context. Benjamin of Tudela. The Itinerary of Rabbi Benjamin of Tudela. Translated and edited by A. Asher. London and Berlin: A. Asher and Company, 1840. Boak, A. E. R. "Notes and Documents: The Book of the Prefect." Journal of Economic and Business History 1 (1929): 597-618. Falke, Otto von. Kunstgeschichte der Seidenweberei. Berlin: Verlag Ernst Wasmuth, 1921. Standard text, superseded in some respects by recent findings, still required reading. Exists in English translation. Flury-Lemberg, Mechtild. Textile Conservation and Research. Bern: Abegg-Stiftung, 1988. Meticulously researched, comprehensive case studies. Geijer, Agnes. A History of Textile Art: A Selective Account. Stockholm and London: Pasold Research Fund, 1979. Lucid and concise, a gold-standard survey. Kalavrezou, Ioli. "Luxury Objects." In The Glory of Byzantium: Art and Culture of the Middle Byzantine Era A.D. 843-1261. Edited by Helen C. Evans and William D. Wixom. New York: The Metropolitan Museum of Art (1997): 218-253. Good survey in important, recent exhibition catalog. Kislinger, E. "Jüdische Gewerbetreibende in Byzanz." In Die Juden in ihrer mittelalterlichen Umwelt. Weimar, 1991. Source for primary texts on pivotal role Jews played in trade and manufacture of textiles. Martiniani-Reber, Marielle. Soieries sassanides, coptes et Byzantines Ve-Xie siècles. Lyon: Musée historique des tissues; Paris: Editions de la Réunion des muses nationaux, 1986. Fine, detailed catalog of this museum's textiles collections. Mathews, Thomas F. Byzantium from Antiquity to the Renaissance. New York: Harry N. Abrams, 1998. Refreshing and synthesizing examination of the Empire and its aftermath. Muthesius, Anna. Byzantine Silk Weaving A.D. 400 to A.D. 1200. Vienna: Verlag Fassbaender, 1997. A valiant and welcome attempt to catalog all surviving Byzantine silk examples; unfortunately, not all are illustrated. Indispensable for further fieldwork. Petrova, Yevgenia, ed. Russian Monasteries: Art and Tradition. St. Petersburg: The State Russian Museum, 1997. A catalog of monastic art, including important embroideries. Sandberg, Gösta. The Red Dyes: Cochineal, Madder, and Murex Purple. Asheville, N.C.: Lark Books, 1994. A richly illustrated guide to the history and technology of red dyes. Schorta, Regula. "Zur Entwicklung der Lampastechnik." In Islamische Textilkunst des Mittelalters: Aktuelle Probleme. Riggisberger Berichte 5. Riggisberg, Switzerland: Abbeggstiftung, 1997. One of the foremost textile-structure specialists accounts for the development of lampas. Soucek, Priscilla P. "Artistic Exchange in the Mediterranean Context." In The Meeting of Two Worlds: The Crusades and the Mediterranean Context. Edited by Clifton Olds. Ann Arbor, Mich.: The University of Michigan Museum of Art, 1981. An early contribution to the accepted notion of the shared Mediterranean heritage in art and architecture. --. "Byzantium and the Islamic East." In The Glory of Byzantium: Art and Culture of the Middle Byzantine Era, A.D. 843-1261. Edited by Helen C. Evans and William D. Wixom. New York: The Metropolitan Museum of Art, 1997. A lucid and definitive contribution on the cultural interactions between Byzantium and Islam. Vogt, A. Constantin VII porphyrogénète: Le Livre des cérémonies. Paris, 1935-1939. Primary source text. Volbach, W. Fritz. Early Decorative Textiles. London: Paul Hamlyn, 1969. A discursive standby, with a focus on the Byzantine material. Zagorsk Museum Collection. Early Russian Embroidery in the Zagorsk Museum Moscow: Collection Sovietskaya Russia Publishers, 1983. Ample black-and-white illustrations add to this important Russian collection.